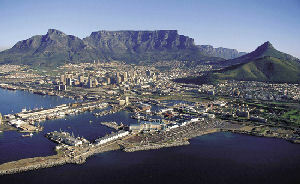 Cape Town is undoubtedly South Africa’s most beautiful city. Cape Town was founded by Dutch settlers under the leadership of Jan van Riebeeck in 1652 and is as such the oldest city in South Africa. However, they were not the first inhabitants of this region. The San and Khoi people used to live around Cape Town for many thousands of years prior to the first European settlement. 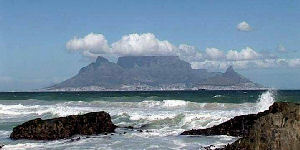 The itinerary of the Cape Tour is highly flexible and depends on the weather and the season. 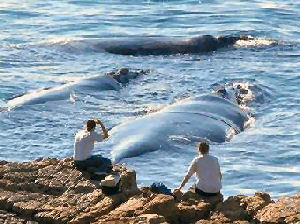 When the whales visit the Cape between June and November, we will certainly make an effort to do whale-watching. 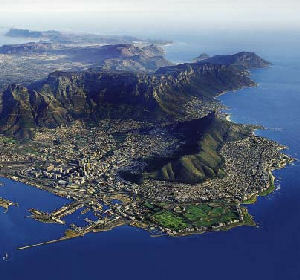 Good weather is essential for our visit to Table Mountain and Robben Island. Fortunately, the tour of the Winelands does not depend on the weather. If need be, we will change the itinerary to best make use of good weather conditions. Your specialist guide will be very knowledgeable about Cape Town and surrounds and will walk the extra mile to make your visit truly unforgettable. Transport will be luxurious but will depend on the group size. Temba Tours only offers private tours. Therefore, your group will be the only one in a particular vehicle. A luxury saloon car will be used for groups of up to three people. Larger groups will travel by luxury minibus. Our policy is to include just about everything in the price of the tour. However, if you stay at the Victoria & Alfred Waterfront, the price of dinner is not included. Your guide will be off duty in the evenings to prepare for the next day, giving your group privacy and time to spend on your own. It is perfectly safe to spend the evenings at one of the many excellent restaurants in the Waterfront, suiting your taste and budget. Which hotel to choose? 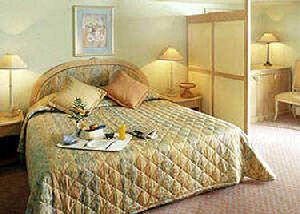 Cape Town has numerous excellent hotels. We will gladly reserve accommodation for you at any of the world class 5-star establishments, providing that you are prepared to pay for it. Unfortunately, hotels in Cape Town are among the world’s most expensive. Your budget will accordingly dictate what you can afford. We select hotels with position as the highest priority. In Cape Town you will want to stay in the Victoria & Alfred Waterfront. This is where the action is. It is safe and there are numerous excellent restaurants, theatres and shops. 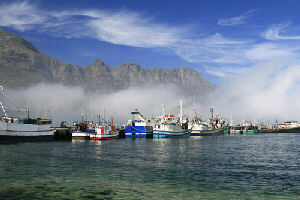 In this area the Breakwater Lodge is the most affordable and therefore our choice of accommodation. It is a very good 3-star establishment and the rooms are equipped with all modern facilities. The hotel is housed in the former Breakwater Prison, which was closed down early in the previous century. Only the exterior and very thick walls will remind you of that era. This hotel does not serve lunch or dinner, but this will certainly be no problem as it will give you the freedom to select your restaurant from the numerous excellent restaurants at the V&A Waterfront. Day 1: Breakwater Lodge. We will meet you at the airport and transfer you to Breakwater Lodge. Depending on where you are travelling from, you will either relax in the hotel or you can decide to visit some of the interesting areas of Cape Town. The arrival of the masters of the Dutch colony in South Africa was followed by that of their slaves. Growing fresh produce for the sailors on the then famous ship route around the Cape was a priority. The first vegetable garden was called the Companje-Tuin. 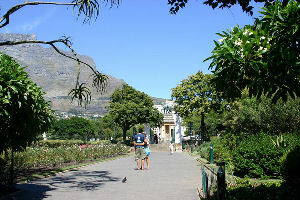 This garden is still one of Cape Town’s famous landmarks but is certainly no longer a vegetable garden. It is now a botanical garden with beautiful plants, numerous squirrels and a very relaxed atmosphere. 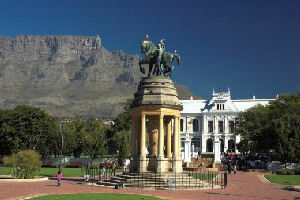 There are a few monuments in the Garden and South Africa’s Parliament is adjacent to it. We will certainly stroll through this garden. The Cape Town Castle is the oldest building in South Africa and you will see it from the outside. If you have a particular interest in the Castle we can arrange a visit. However, it might take some time to arrange the visit, so you might need to sacrifice your visit to some other more interesting sights. 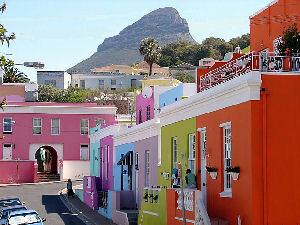 After the emancipation of the slaves in 1834, they established themselves in an area known as the Bo-Kaap. Most of these slaves came from Malaysia and Indonesia, bringing with them their very colourful culture. Their culture integrated with the numerous other cultures of South Africa. Although descendants of the slaves are spread around South Africa, the Bo-Kaap remains a very distinct and colourful area. The people are friendly, love their music and are certainly not timid when choosing a colour when painting their homes or doing their street parades. You will spend tonight at leisure in your hotel and in the V&A Waterfront. No meals are included. Day 2: Table Mountain and Robben Island. 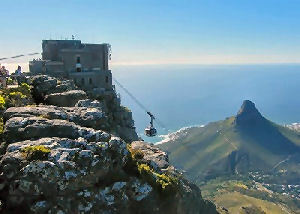 Table Mountain is arguably the most famous landmark in South Africa – if not in Africa. The mountain is about 1000 m high and it offers breathtakingly beautiful views from the top. It is to the best of our knowledge the only World Heritage Site which gives you a perfect view of another World Heritage Site, Robben Island. Table Mountain is part of the Cape Floral Kingdom. There are more than 2000 species of plants on the mountain which makes it one of the areas in the world with the highest biodiversity per square metre. Among the many plants are some of the world’s most beautiful flowers and very colourful proteas. We will take the revolving Cable Car to the top of the mountain and back. You will therefore enjoy a view in all directions while travelling up and down the mountain. We will return to the V&A Waterfront for a light lunch before we depart to Robben Island by boat. The 12 km voyage takes just less than an hour. As soon as we arrive on the Island we will be taken on a guided tour of this World Heritage Site. The tour will include the lime quarry where prisoners used to work, as well as the island’s fauna and flora. The highlight of our visit will certainly be the notorious prison where Pres Jacob Zuma was incarcerated for 10 years and Nelson Mandela and others for 18 years and longer. We will see Mr Mandela’s cell. Our guide will be a former political prisoner of the island. We will return to Breakwater Lodge and the V&A Waterfront. Breakfast is the only meal included today. Day 3: The Winelands. The route we follow for our tour of the Cape Winelands will depend on whether there are any whales present along the Cape Coast. If there are whales to be seen at Hermanus (South Africa’s “whale capital”), we will visit this town along the South Coast. These massive mammals sometimes come within metres of the shore. Hermanus is a very pleasant town and you will certainly enjoy the vibe and numerous little shops. On our return we will enjoy a light lunch on a wine farm in the Elgin-Grabouw area. This area is famous not only for its apples, but also for very high quality wines. Wine tasting will be included. If it is not whale season we will rather visit the historical town of Franschhoek where we will have a light lunch. This is a beautiful little town with numerous small shops and a very rich history. 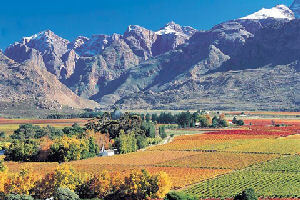 Some of the country’s best wine estates are in the Franschhoek area. During the afternoon we will visit Stellenbosch, the famous university town and second oldest town in South Africa – irrespective of the morning’s route. In the Stellenbosch district we will include wine tasting on a wine estate. You will be at your leisure tonight. Day 4 : Cape Peninsula Tour. Our Cape Tour will take us through the Cape Peninsula with its breathtakingly beautiful views and scenery. We will drive via Cape Point and Camps Bay to Hout Bay. Hout Bay is a beautiful town just south of Cape Town. It is still a fishing village, albeit a very modern one, with an excellent atmosphere. We will take a boat trip on a glass bottomed boat to a seal colony just outside Hout Bay, where you will be able to see the seals from up close. 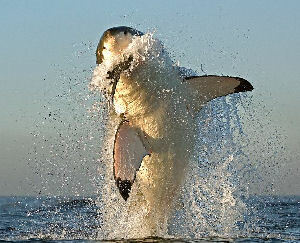 The only enemy of the Cape Fur Seal is the Great White Shark, which is rather common around the Cape coast. We will be very lucky to see any Great White Sharks. From Hout Bay we will drive via Chapmans Peak to Noordhoek. We will stop to enjoy the beautiful view across the bay and hopefully we will see some whales. With or without whales, the scenery promises to be nothing short of spectacular. From Noordhoek our Cape Tour will take us to Cape Point. This is touted by many tourist information brochures to be the most southwestern point of Africa. To Temba Travel, this sounds rather like a tourist trap. It is definitely not the most western point, or the most eastern point – so how can it be the most southwestern point of Africa? 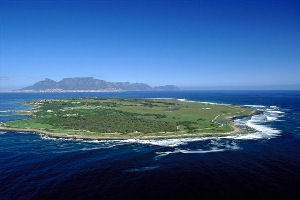 However, the beautiful scenery of the Cape Point Nature Reserve is no tourist trap. The area is renowned for an abundance of baboons. We will take the funicular to the top and walk down to enjoy more of the scenery. 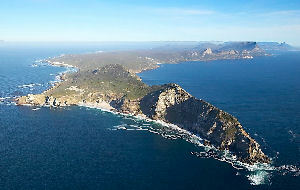 Cape Point will certainly be a highlight of your Cape Tour. We will enjoy a light lunch in the restaurant at Cape Point before we continue with our tour. 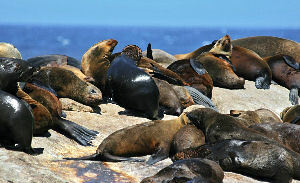 In Simonstown we will visit the Boulders Penguin National Park. This park is the smallest of South Africa’s many National Parks. 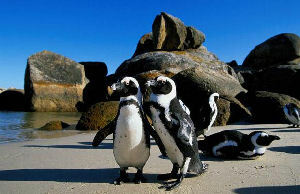 It was created to protect the African penguin through an initiative taken by local home owners. South African National Parks only recently took over the park. You will see large numbers of these highly endangered birds in their natural environment. Our last visit of our Cape Tour will be Kirstenbosch – South Africa’s most well-known botanical garden. We will enjoy our afternoon tea or coffee in this paradise before we return to the Breakwater Lodge, where your group will spend your last night at leisure. Day 5: Homeward bound. You will be at leisure until it is time for your guide to take you to the airport. Farewell will most likely be the worst part of your visit of Cape Town! OTHER TOURS AND SAFARIS BY TEMBA TRAVEL. The Namibia Botswana Safari commences in Walvis Bay in Namibia and ends in Chobe in Botswana. The Eastern South Africa Luxury Safari is a safari tour and it includes Kruger National Park, the Panoramic Route, Swaziland, Zululand and the KwaZulu-Natal Drakensberg Mountains. The Kruger Park Safari is a three night safari of the Kruger National Park in South Africa. The Arid Region Tour includes the flowers of Namaqualand in South Africa, the Richtersveld National Park, the Fish River Canyon in Namibia, the Kalahari or Kgalagadi Transfrontier Park, as well as Augrabies National Park in South Africa. Amazian Mountain River Lodge in Underberg in Kwazulu Natal is a romantic destination with beautiful views over the Drakensberg Mountains of Kwazulu Natal. Gables Inn is in Colesberg in the Northern Cape Province of South Africa and offers self-catering (self contained) accommodation halfway between Cape Town and Johannesburg. Upington Accommodation provides accommodation in Upington in the Northern Cape of South Africa such as lodges, hotels and guesthouses. The Cape WInelands Tour recommends Garden Route Tours with Southern Circle Tours & Safaris. Kwando Camp is a luxurious lodge on the Caprivi strip in the north-east of Namibia on the banks of the Kwando River. Perhaps you want to visit Botswana after your tour of Cape Town. Mokolodi Nature Reserve offers self-catering (self contained) accommodation in a nature reserve 12 km south of Gaborone which is the capital city of Botswana. Temba Lodges provide hotel, lodge and self-catering (self contained) accommodation in South Africa, Botswana, Namibia and Zimbabwe. Temba Car Hire provides car and minibus hire in all cities of South Africa as well as in Namibia and Botswana. Temba Car Hire provides 4×4 vehicles in Maun, Windhoek, Kasane and Gaborone in Botswana. The Churchill Hotel is a famous hotel in Bulawayo in Zimbabwe. The Churchill hotel is 5 km from Bulawayo CBD on the route to the Matopo National Park. The Jameson Hotel in Harare has been the best known hotel in the CBD of Harare for many years. The Jameson Hotel is a luxury but affordable destination.